This time of the year is crazy. Actually, it’s crazy most of the year, but add in the holidays and we get super-charged craziness. Now how do we take it all on and remain balanced? Water is essential for our bodies. Did you know that water makes up more than 2/3 of the human body weight? When our water levels drop, we see signs of dehydration: headaches, trouble focusing, difficulty with memory, and fatigue. It’s recommended that we drink 8 cups of water per day, which equals 64 oz. I, on the other hand, drink nearly 100 oz a day. I feel that when I drink more water, I don’t crave those sweets nearly as much. Load Up on the Fruit and Veggies. 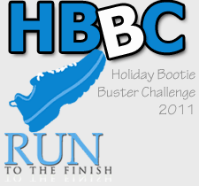 Amanda at Run to the Finish has a Holiday Bootie Buster Challenge. Each day, I can earn an extra point if I eat 7 servings of fruit/veggies. I enjoy rising to the challenge each day by making sure I get my 7 servings in each day. Craving something sweet? Grab an orange. It would be crazy of me to suggest to you to stay away from all holiday goodies. I have found that if I go out of my way to avoid them, I crave them even more. Go ahead, live a little and eat those yummy treats at those holiday parties. You’ve got to enjoy life too, but don't go overboard. Make it a priority to get your sweat on daily. Schedule it in if need be. It might not always work to get in an 8 mile run BUT you can definitely squeeze in a 30 minute workout, right? I miss these days when she was so little! Your body needs 6-7 hours a night to recover. I’m guilty of giving up my sleep when the tough gets going, but I have found I am a much nicer person to be around when I get my sleep. My family, friends and students all benefit from a well rested me. There you have it. My 5 tips to maintain balance during the holidays. Great tips! You are so right about the water!